This design is one of the first customized designs I made for a mama with two kids. After stamping the names of her kids, I hammered those shiny orbs to get some texture. 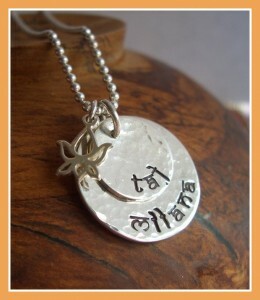 Slip on a lotus flower charm and voila, you have a unique, personalized necklace with the names of loved ones. My sanskrit-style font adds a very unique touch to my designs! The creators of the font did a brilliant job of manifesting the Indian Devanagari script into the English alphabet. It only seems appropriate to begin my first post with a photo of a design that features Ganesh! For all who know of him, he is a happy god who is the remover of obstacles and giver of wealth. We begin all new endeavors with a salute and prayer to him in the hopes he will do his magic to create a trouble-free journey! 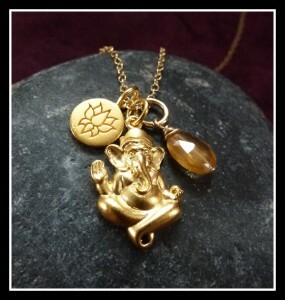 The 24k gold-plated sterling silver Ganesh is accompanied by a gold-plated bronze charm that features a lotus flower and a hessonite garnet stone. Ayurveda, the traditional healing method of India, believes that hessonite garnet helps to quiet the mind and calm the nerves. A healing stone to counter negative energy? Not a bad idea!